(A) Can’t get a good night’s sleep? (B) Too much caffeine or too much stress? (C) Are the slightest annoyances getting under your skin? (D) Are you wanting to “go there” more often than not? (E) Have you been ignoring God reaching out to you for quality “WE” time? 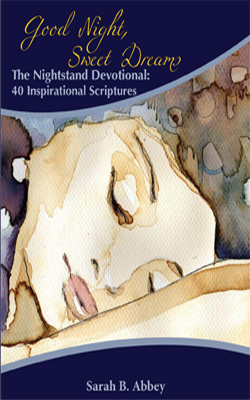 throughout your busy day, this little book will impart the serenity you seek to get a good night’s sleep. Receive rest and renewal as you drift asleep, and awake refreshed for a joyous new day.